The registration for the upcoming SOA & E2.0 Partner Community Forum event is open! An excellent event to meet each other again! The Partner event will be located at Capgemini, Utrecht and the technical hands on and workshops will be at Hotel Vianen, Utrecht. Also read “SOA & E2.0 Partner Community Forum XIII registration is open“. The book is written by Antony Reynolds and Matt Wright. Both known from their own blogs. The last week of 2010 i finally had some spare time to finish my read of this great book. After reading the other 11g book, Getting Started with Oracle SOA Suite 11g R1, i was hoping to find some extra information in this one (and i did). The guides of the SOA Suite 11g which get supplied by Oracle itself reflects this great book, a lot of information, and more important, a lot of detailed information. 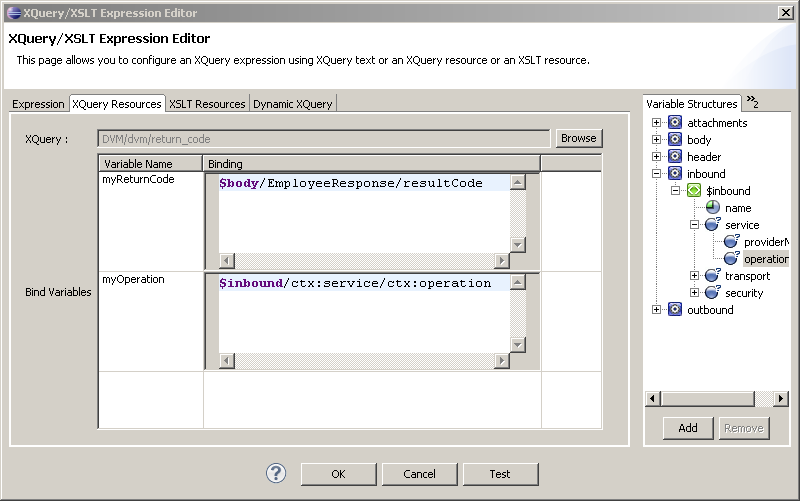 Ready to use examples which are an ideal way for all to get familiar with the SOA Suite components. Since the SOA Suite is becoming a huge product it took some paperwork to describe everything on highlevel functionality. The authors made a good combination of describing the concepts of a Service Oriented Architecture. 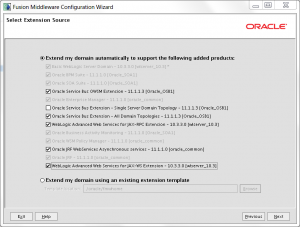 How to implement these concepts and their relation to the whole process of defining and creating your own service by use of every component in the Oracle SOA Suite. What i really liked in this book and missed a bit in the other one (maybe it was still too early for it), was the compare/description of the Oracle Service Bus. The authors did a great job on describing functionality of components existing in the SOA Suite and how to model them in your own processes. 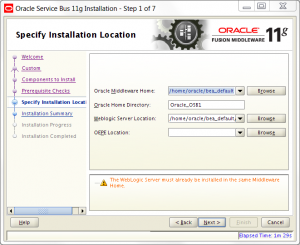 After that for certain parts of the suite they stepped over to the Oracle Service Bus and described very well how and what components to use in here. Readers will have a clear view what will be possible in both products and how to model process in both of them. Since the book is mainly about the SOA Suite don’t expect the find all details about the Oracle Service Bus, but they did a good job on focussing on both products. Chapters 1 till 10 (Part1 : Getting Started) will give you overview information about the aspects of SOA and the components which are available in the SOA Suite. PeterPaul already showed us in his blog how to install a new wls server in the image and install the Oracle Service Bus in the new server. 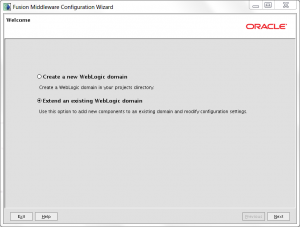 In my blog i will use the wls of the SOA Suite and extend the domain with the Oracle Service Bus application. In the WebLogic home of the SOA Suite there isn’t an OEPE installed. This will be needed for the OSB installation. Installation of the oepe in the weblogic home is done. Unzip the file and run the installer. Now the installer will also see the correct location of the OEPE home. Next, next and we’re done. 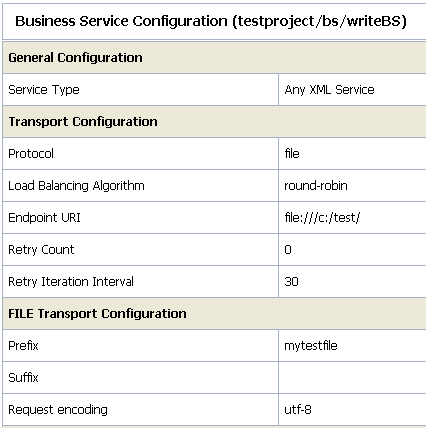 When testing the db connection for the OSB JMS Reporting Provider use the xe connectstring. 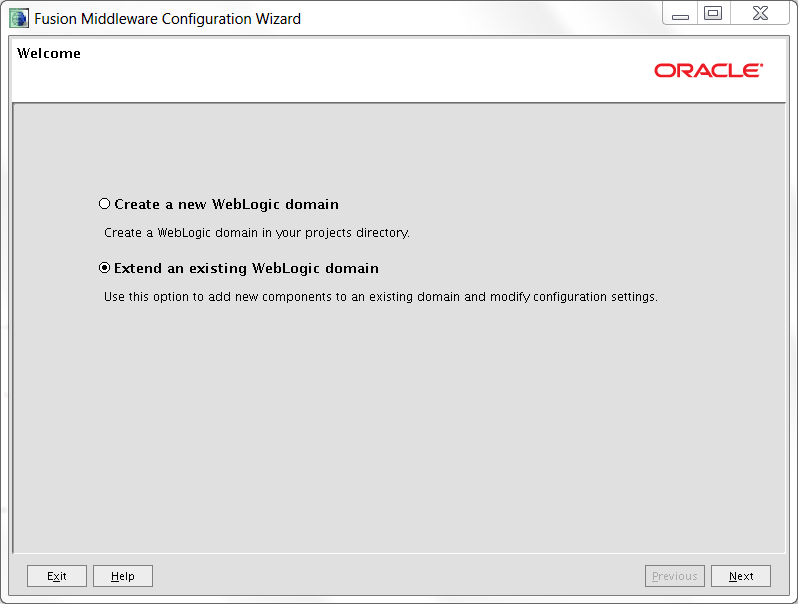 Start the server again by use of the ´Start/Stop WebLogic Server´ icon on the desktop. Lateron i will try to investigate this error. 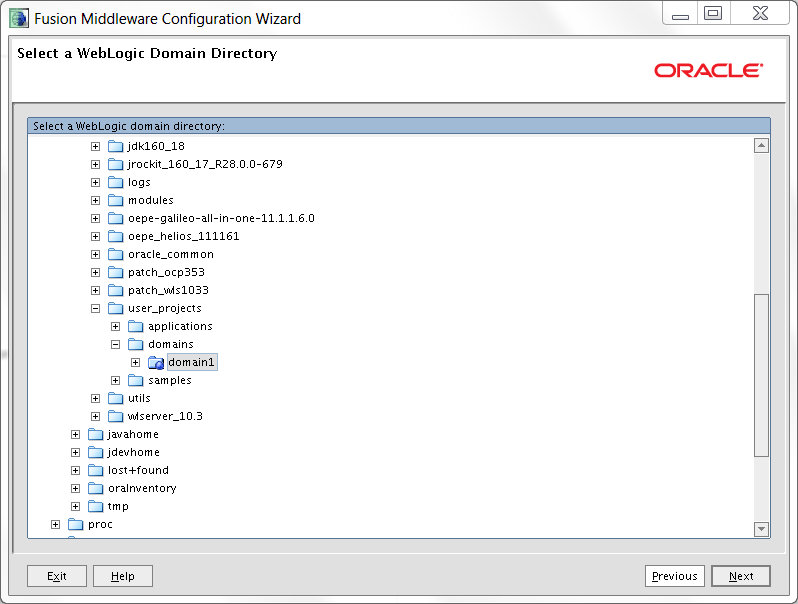 For now i updated the blog to make use of the ‘Single Server Domain Topology’, and now deployment of the composite still works and i can add resources in the OSB Console. 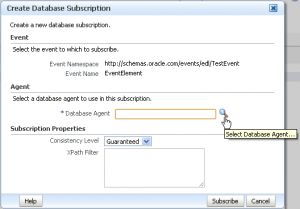 In the Oracle SOA Suite we can create events by use of the Event Driven Network (EDN). See my one of my last articles on how to produce such an event from with plsql or how to produce it from bpel. The next step in the process is to consume these events and execute business logica based on them. 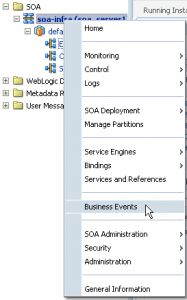 In the SCA composite applications we can use the Mediator to subscribe to the defined events and route them further on to other components in the process (for example bpel). 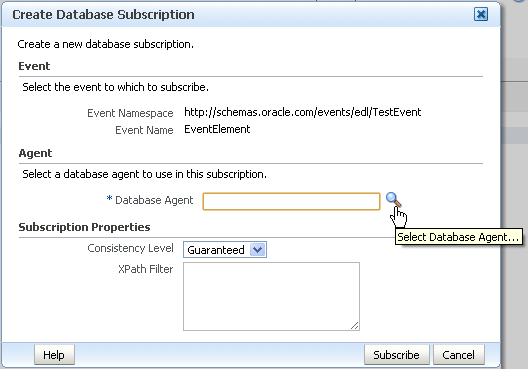 In the Enterprise Manager we can also subscribe a ‘Database Agent’ to our events. In the ‘Select: Database Agent’ popup window we will see an overview of the registered database agents. Click the ‘Create agent’ button. 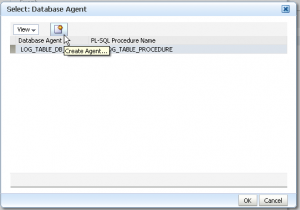 In the ‘Create Database Agent’ popup windows we can create our agent and point it to our database procedure. We will create the procedure itself later on. Creation of the database agent is done. Go to the ‘Subscriptions’ tab. We will see an overview of all the subscriptions on our events. At this moment we have 2 subscriptions. One for our database agent and one for the mediator component which we created in the other article. After these steps the documentation is really lacking of good info. I couldn’t find any details on what the stored procedure interface should be to be able to connect it to the database agent. 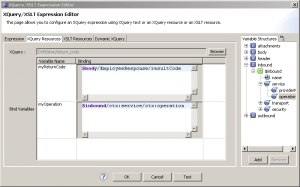 Now we can query to table ‘EDN_LOG_MESSAGES’ to see the output of the edn process. After searching in all the sql object creation files i could track the error message down to the procedure ‘edn_filter_and_deliver_event’. Now we can finally construct the interface of our procedure (MY_LOG_TABLE_PROCEDURE). It needs 3 parameters : event_namespace (of type varchar2(256), event_local_name (oftype varchar2(80) and event (of type edn_business_event). For testing purpose i will only log the event object. Time to test the database agent. Trigger an event from the console and check filesystem to see if the process completed. Now go to the database table and query the ‘MY_LOG_TABLE’ table. 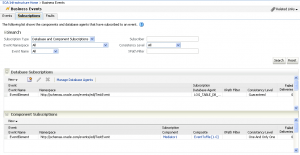 The subscription of the database agent works. 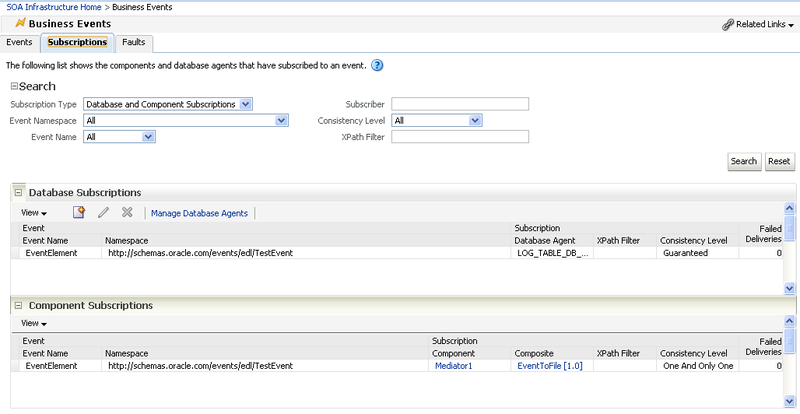 Now we have the opportunity to let components from both the database and middleware subscribe to events. 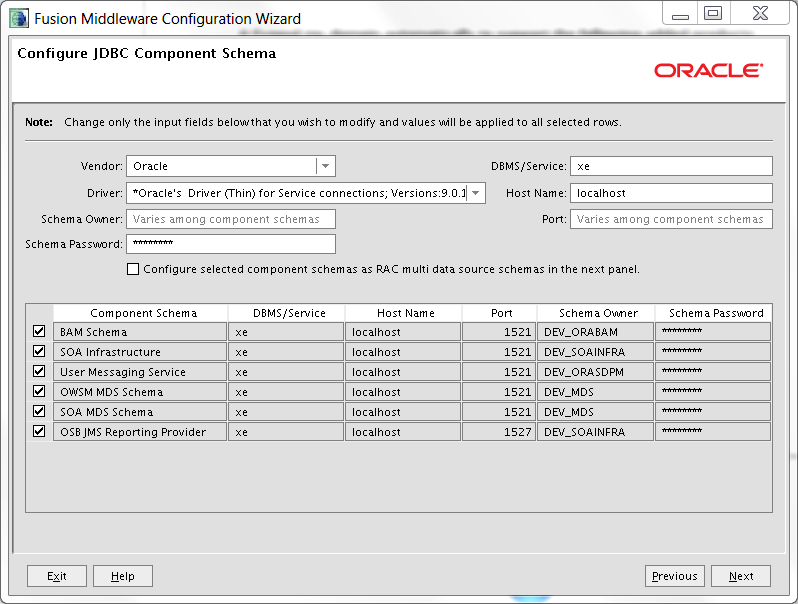 With the release of the soa suite 11g Oracle supplies us the EDN component, Event Delivery Network. Basically it supplies us a publish/subscribe model to trigger and subscribe on defined business events. To ‘throw’ the events we can make use of both the java and plsql apis. For this demo i will shorty show how to trigger them from bpel/the console and a plsql call. The bpel interface will be used just for triggered the event. In the bpel itself we will use the invoke activity to not invoke a partnerlink but to invoke/trigger the event. The Mediator component will subscribe to the event and will just write it back to filesystem. Or we can just use the Enterprise Manager console to trigger the events. 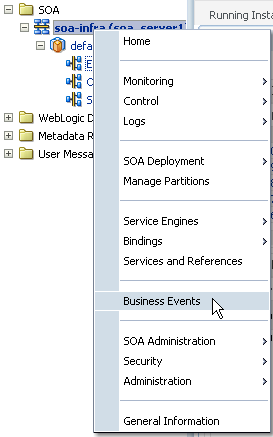 In the console go to the soa-infra application, rightmouseclick and go to ‘Business Events’. To be able to trigger the events from within plsql we just have to call a ready to use procedure from the soa_infra schema (DEV_SOAINFRA in my case). 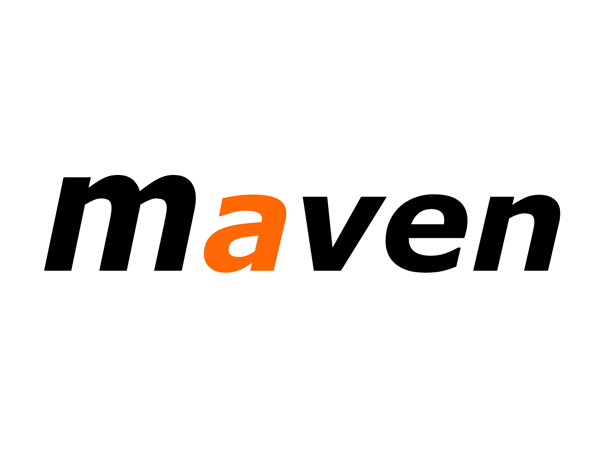 To implement decoupling in the middleware, events are an important concept to be use. 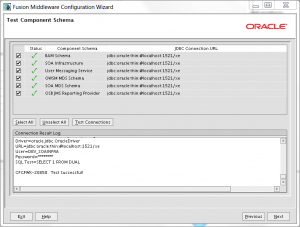 Event Driven Architectures are based on them and in the Oracle SOA Suite Oracles supplies us the EDN (Event Driven Network) to help us implement such an architecture. 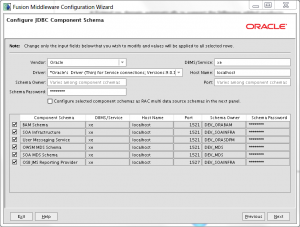 To eventually be able to produce events from within the database and consume the events from the Middleware we could have used Oracle AQ and one of the JCA Adapters Oracle supplies us. 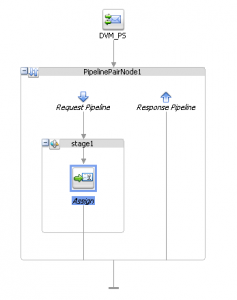 To process events from the database and consume those in the Middleware by use of the EDN functionality we can now just make use of a simple database procedure call. 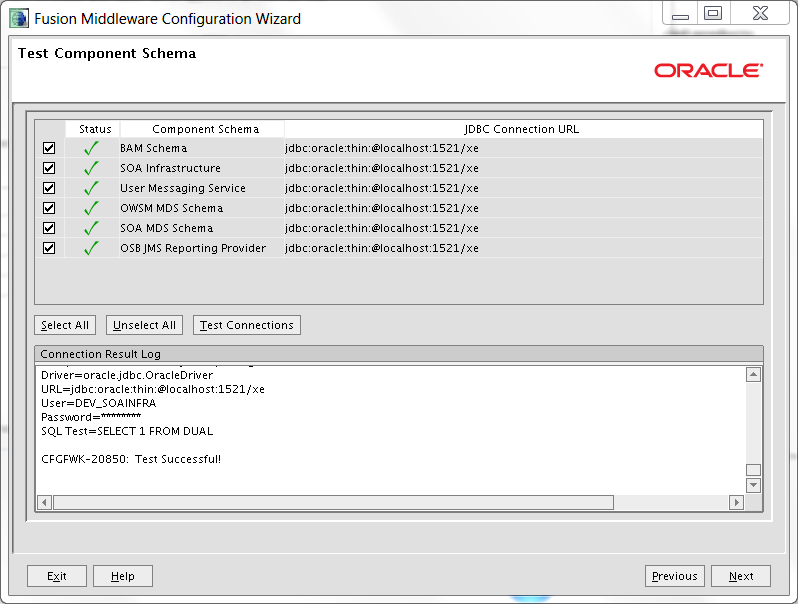 The EDN will just process the event like every other event produced in the Middleware. Google will give enough hits on the topic, too bad not one which fixed my issue. Normally you would create an OSB project, create an OSB Configuration project, drag the OSB project on the Configuration project and your done. 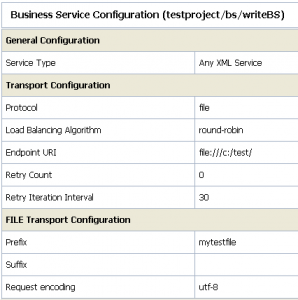 \OSB Configuration\.settings\com.bea.alsb.core.prefs and edit the row ‘container.referenced.projects’. At the end add the name of the project you’re try to link to your Configuration project. Restart Eclipse and clean (Project > Clean) both the Configuration project and the OSB project. And ex-colleague asked me to give a little help on setting the filename which was getting created by his Oracle Service Bus flow. 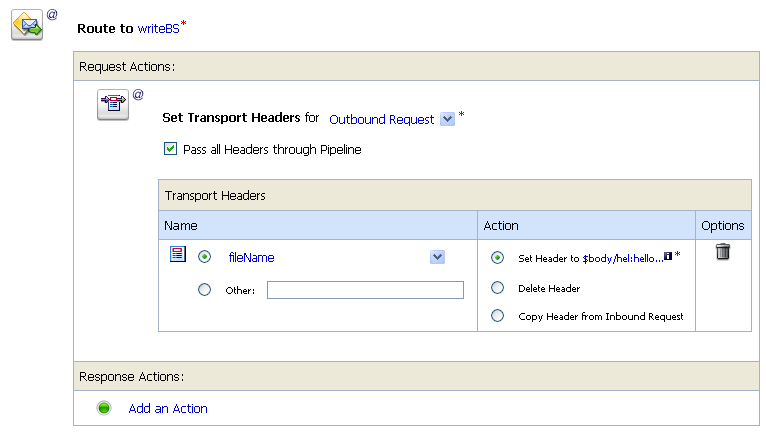 Create a new business service with file transport and set the correct location of the file with his prefixes. In this wizard we can only set the prefixes and the location of the file, so no option to set the filename by use of some expression. For the interface of the proxy service i used the almighty helloworld wsdl, and the content of this request we will put in the file. The name of the file will have the value of the first argument (‘arg0’) on the ‘hello’ operation (in this case ‘John’ with the prefixes). 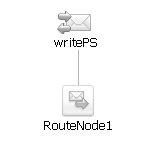 In the flow route to the business service (or use the option in the ide to create a proxy service from a business service). 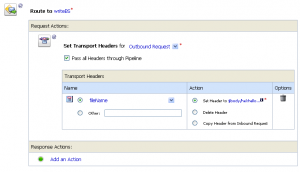 Open the route and the only thing we need in here is the activity ‘Set Transport Headers’. Since we’re routing to a business service which makes use of the file transport we can make use of the ‘fileName’ property of the ‘file’ part. If we would have create a business service for some other transport we could also make use of all the other properties to override values in the routing. Just browse the list, a lot of usefull properties to use. 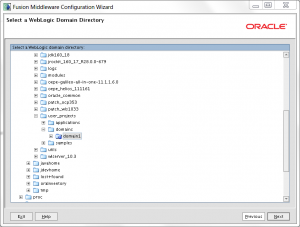 We select the ‘fileName’ of the ‘file’ part, and at the right we will now be able to use an expression to override the default generated filename by the Oracle Service Bus. In our case we will select ‘Set Header to’ and use the expression ‘$body/hel:hello/arg0/text()’. Save the flow and run the proxy service. Using the payload from above the next file will be created ‘c:\test\mytestfileJohn’. Prefix + ‘John’ from the payload. 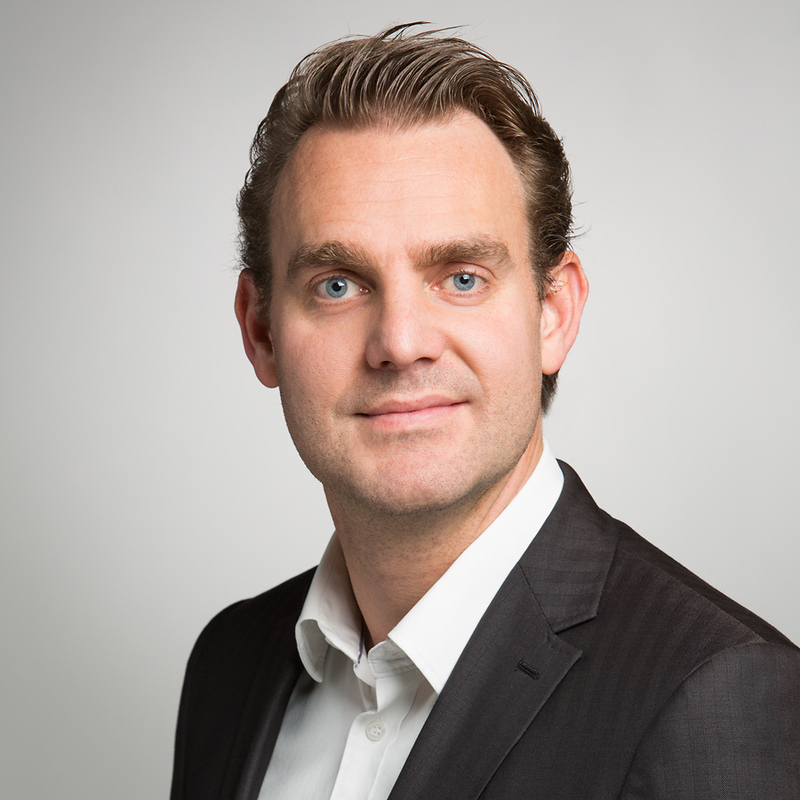 A new methodology group, SOA-BPM Enterprise Methodology Group, has been started by Lonneke Dikmans. To join the group, please fill in the survey.